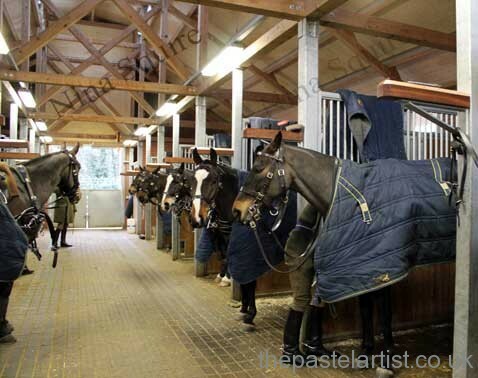 I’m artist in residence at the home of the Royal Artilery, Larkhill. I’m lucky that my easel looks out on some of the most fantastic view of Salisbury plain whilst I work on my commission work. Whilst drawing at an event earlier in the year I met The Commanding Officer of The King’s Troop Royal Horse Artillery, Major Mark Edward, who was visiting the event and was generous enough to admire my work. 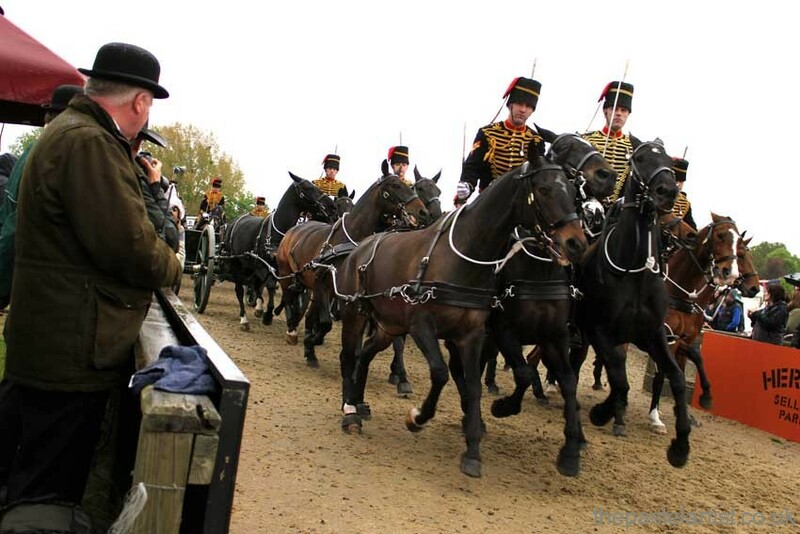 He very kindly invited me to visit the Kings Troop at their new home in Woolwich – could I capture a little of The Troop to bring back to Larkhill, their home? The King’s Troop Royal Horse Artillery is a British Army mounted, ceremonial unit that fires Royal Salutes on royal anniversaries and state occasions, and they provide a gun carriage and a team of black horses for state and military funerals. The King’s Troop also has a vital operational role. Their soldiers are trained as fighting soldiers, with six of them currently deployed in Afghanistan. When the Army mobilises, the unit provides heavy goods vehicle drivers who deliver ammunition to artillery units around the battlefield. Visiting the Troop on one of the coldest April mornings didn’t dull the privilege of being given a ‘behind the scenes’ look at this fantastic new purpose built building. It is a fantastic piece of architecture and houses the 6 lines of horses alongside the gunners and officers. I arrived at just before 7.30am, long after the horses and soldiers had started preparing for the day of training in preparation for The Royal Windsor Show in May. They train twice a week, in all weathers. Sketches were tricky in a working stable but some things seemed important to capture. Most important for me was the bond between the gunners and the horses. Watching the gunners prepare the horses and tack for the training session I was aware of the speed in which this well organised Troop work. 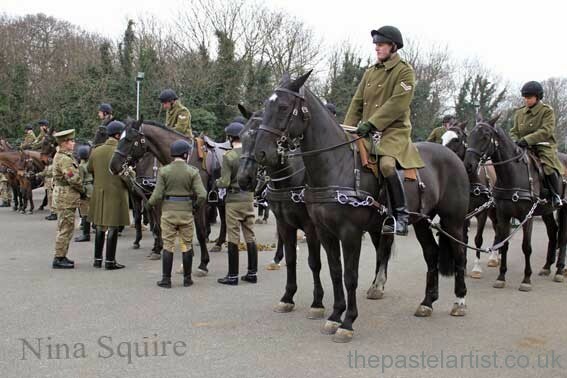 The horses and gunners line up waiting for the officers to lead the procession to the training ground. Its bitterly cold but there is no mention of the sleet that’s already falling. I watch them form an orderly procession out of the barracks and then follow onto the training ground. The Troop arrive and prepare the horses, the horses all have special studs screwed into their shoes to help them grip on the grass as they preform the ride. I was given a spot to stand and was offered the cab of the army truck if it got cold. The officers took position on top of the cab to inspect the display. Nothing can prepare you for the noise of that many horses cantering past you; it is immense. 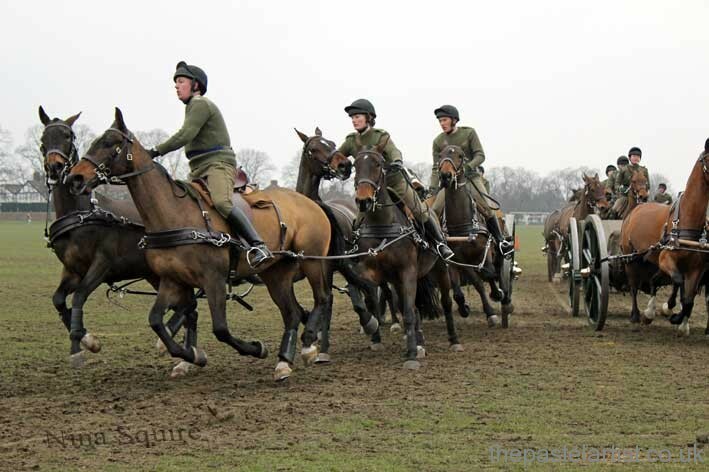 The Troop thunder past me at a canter, during the Windsor Show they will be at full gallop. My position was the focus point of the ride. I sat where the Queen would view the ride from during the Windsor Show display. The horses and guns form two lines, head straight for my position and then split as they reach me. That image will remain with me for some time! The noise included, chains clinking, horses hooves and shouts from the officers but I was unprepared for the ground shaking as they passed by. One of the gunners bringing the jackets for the officers after a cold practice drive. Back at the barracks the cleaning of the tack started. 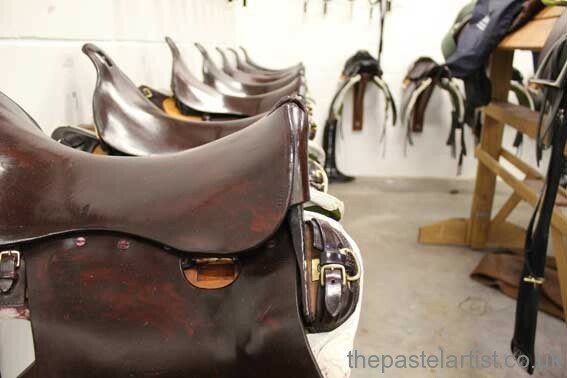 Saddles in lines with highly polished leather – these are just for training, for the performance they will use the more decorated tack which has an even more glossy appearance. I loved this instruction label! Visiting The Troop at Windsor Castle was just spectacular . I had just parked the car only to walk out and see them trotting up the main high street after exercising the horses. 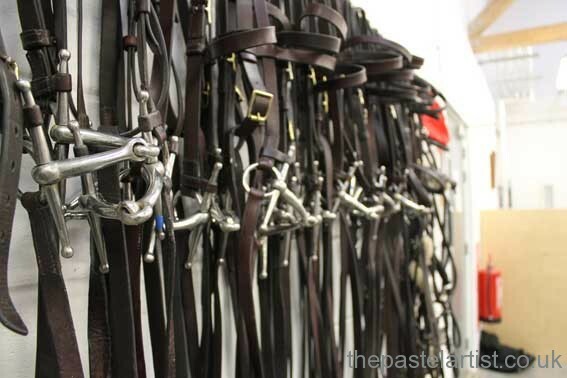 Exercising the horses at 7 am – I see them as I leave the car park and know I’m in the right place! I’m invited to see the horses and have a quick tour and then left to spend more time looking at the horses. The views of Windsor Castle are all made more magical as I was able to see from my privileged behind the scenes view. 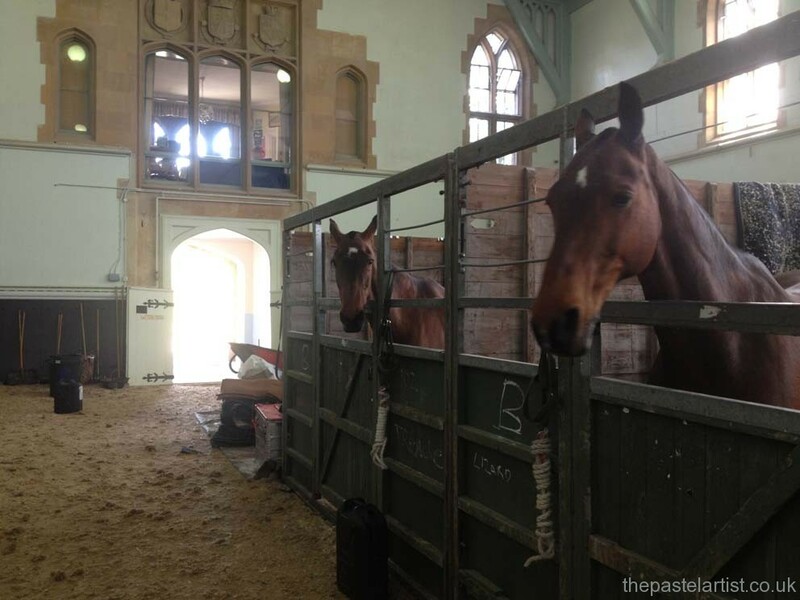 The inside school at Windsor Castle – temporary housing for The Troop horses. 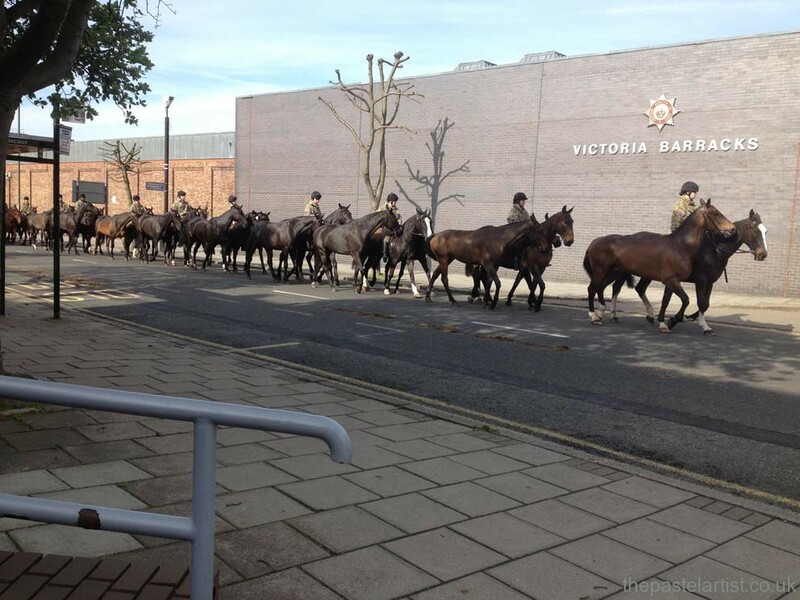 The Troop leaving the arena! A sound that I can’t describe! This entry was posted in Uncategorized on June 14, 2013 by thepaste.